“Je ne savais pas ça !” (I didn’t know that!) I told my sister-in-law. We were eating lunch. It happened on a Tuesday in January when my family visited us. I had cooked wild Alaskan salmon in a light broth flavored with aromas of coconut milk, lemongrass and lime, and I served it with steamed brown rice and green asparagus on the side. Geneviève and I were talking about the salad. La salade. Food that my brother Benoit and I would fight over at every meal, when we still lived together with my parents. The usual for us. Benoit obviously loved salad. He was known as the one always finishing the last bit of salad in the bowl. I was too. Only not as determined as he was. 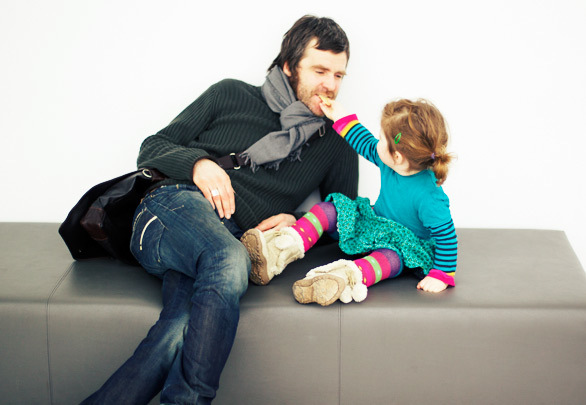 Years later, whenever he and I sit around a table to eat, the same salad debate occurs. That Tuesday, it was watercress salad that I had decided to serve with our meal and that prompted Geneviève to exclaim that it was in fact my brother’s favorite. I could see that the sight of the salad was making her happy. “Vraiment?” (Really?) I asked, looking then at my brother who was eating and smiling between each mouthful. “Oui,” she continued. “Au Maroc, on mangeait de la salade de cresson à tous les repas.” (When we were in Morocco, we’d eat watercress salad at every meal.) She was referring to the recent trip they had taken to Morocco with her sister and husband, both food people. Like Benoit, which is a thing Lulu took quick notice of. Gladly. I, too, would have loved to eat watercress salad at every meal if traveling to Morocco. I imagined the different varieties of watercress, the different shapes, colors and flavors I would be able to find…and eat. Why not? I thought. Lundi, mardi, mercredi, jeudi….every day of the week. Naturally, I embraced the idea. And started eating watercress at every lunch, sometimes dinner too, to accompany dishes of rice, pasta, roasted vegetables, tarts–any foods I prepared. It’s the peppery taste of watercress that makes it, I find, irresistible and distinctive. I am happy when the salad is served on its own, or when it is combined to more ingredients; when it is sometimes dressed with just a drizzle of balsamic vinegar and olive oil, or at other times with a mustardy dressing. This recipe is an example amongst many of how I like to dress watercress: paper-thin slices of radish and apple, crumbles of feta and black sesame seeds–truly a favorite. Yet another dish, I know well, my brother would fight over for the last piece. But this time, I kept it to myself. To prepare the dressing: In a bowl, add the ingredients in this order: sea salt, pepper, lemon juice and honey. Whisk in the oil and emulsify; set aside. In a large bowl, toss gently the salad ingredients. Add the dressing and toss. Sprinkle with sesame seeds and serve. Ahhh, purple watercress! Such a great color. Wonder if our local farmers markets would have it because it is surely difficult to find purple watercress in the mainstream grocery stores. The salad looks gorgeous though. And you are right about the peppery bite of watercress. Bet this would be a nice swap for watercress soup too. I love watercress, it is so versatile and delicious in salads. This is a gorgeous one Bea! I believe watercress is an underated green leaf and certainly we should be eating it more often. Watercress in a salad is not a new thing to me but I´ve never seen it like your showing it here, the image I had was of a flavorless salad my Mom used to prepare when I was a kid. I never knew there was such watercress variety. I love brothers, thank you for the story! I too love watercress. In salads. In sandwiches. Oh my, I also love it with ricotta salata cheese. Very pretty, Bea! Watercress is so good, so peppery! With radishes wow! I love watercress salads–I actually mix it with mustard greens and spinach as a base for most of my salads. Yum! The purple watercress is lovely. I’ll be on the look out for more variety! My biggest seller at the farmer’s market was a crab and watercress tart. Watercress is lovely in any salad! I love the purple watercress i looks beautiful! I love water cress and should try to grow it in the garden but the ground is all wrong (mostly too dry). 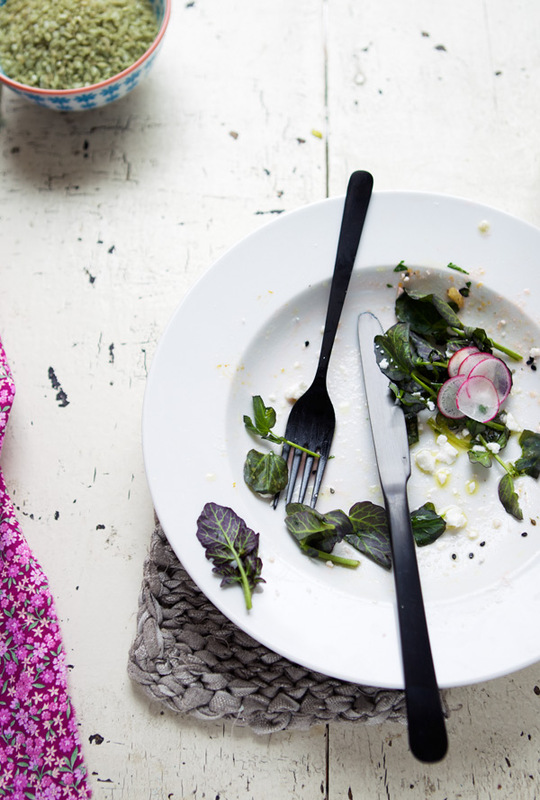 Love Watercress in salads….beautiful pics Bea…looking forward to meeting you @FBC11…PS:where did ya find those beautiful fork and knife in black? 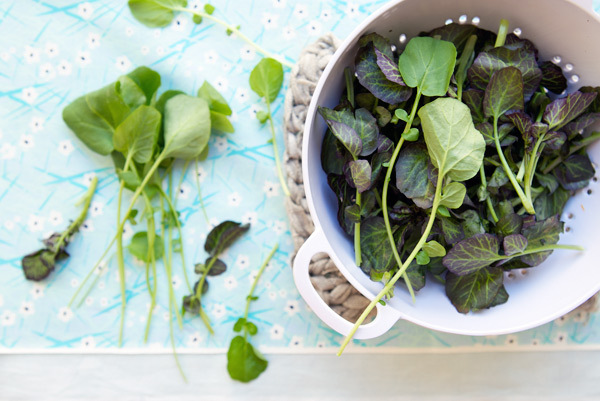 I also love watercress sauteed with other greens – you know it give spinach a little oomph! The Duo Dishes is right – purple watercress looks amazing. It’s the perfect subject for the food photographer. We have watercress growing all over Beaty’s Creek. We love it! have you ever cooked it??? So good! Oh yes Stacey, I cook with it all the time. Lulu’s favorite in pasta and rice dishes. Wow! Your blog is amazing!! Béatrice your pictures are beautiful! And the recipe very appetizing! Thanks a lot! I will follow you! 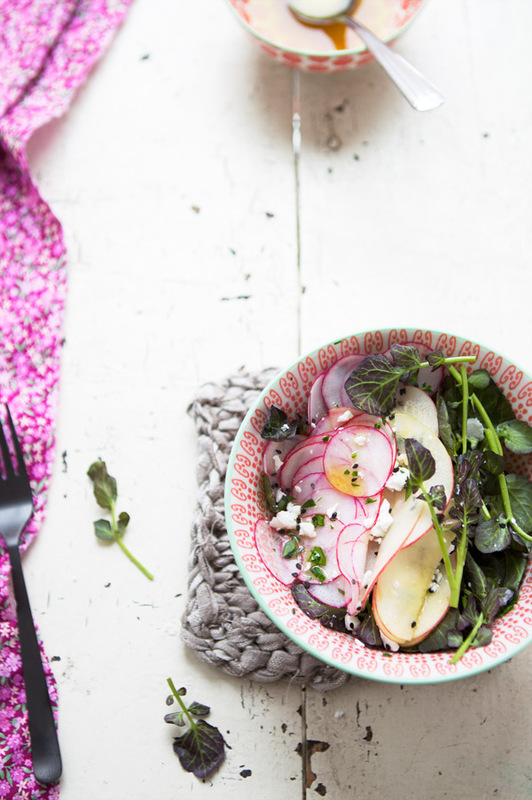 Love yours watercress salad, especially addition od pink radish ! Photos are lovely as usual. I love the idea of a slightly sweet dressing, and the tart sweet apples with the peppery greens. It sounds lovely! 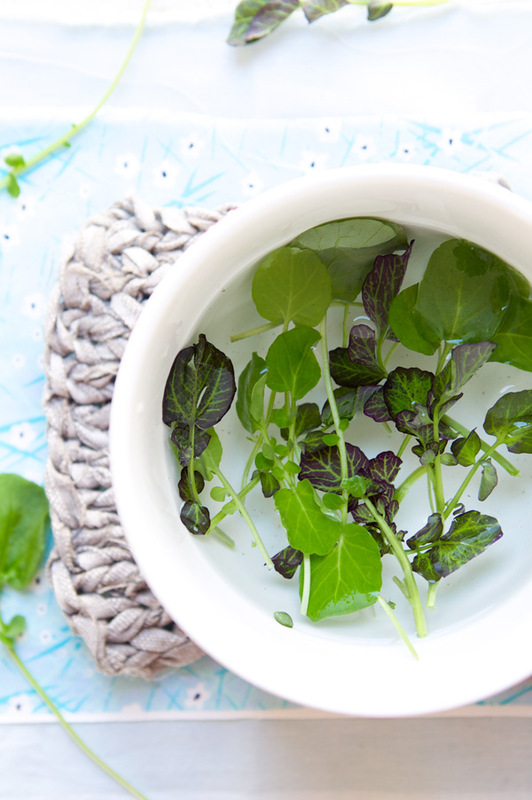 I rarely use watercress for salad – but I should! I usually whir it into a creamy green soup, which is also wonderful. Can’t go wrong with fresh salad, especially watercress. Beautiful photos! 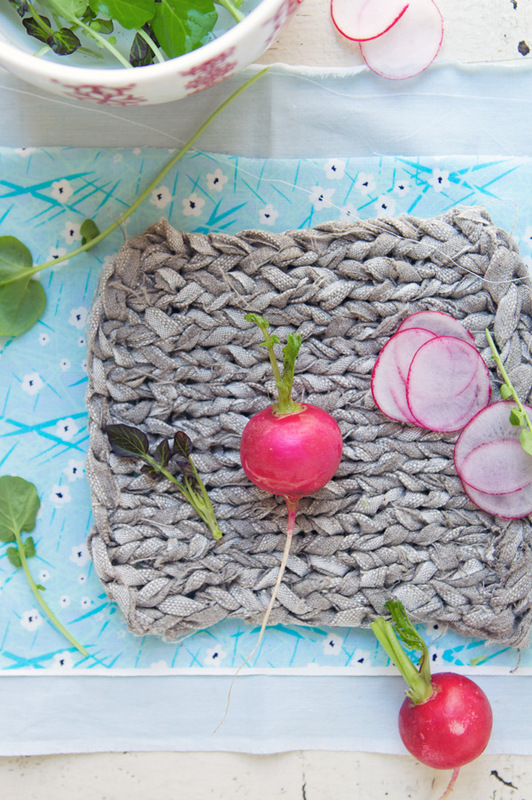 Those transparent slices of radish are exquisite! simple & healthy! I like watercress a lot; for salads but also for soups; one of my favorite is pear&watercress cream soup served with Gorgonzola. Great photos! Watercress is great with thin slices of orange to balance the peppery flavour; add some black olives and a grain-mustard vinaigrette et voila! the best-ever watercress salad. What beautiful photographs and writing! I’ve only recently tried watercress and love it’s peppery flavour. I must try the combination of apple and radish – sounds like an interesting conversation. When i was a child the only watercress I had tasted was the wild one, growing in rivers in spring, and very peppery. I loved it! I cannot find watercress in Germany, if you don’t count the ridiculously small sprouts.. I am completely obsessed with cress! My favorite is Upland Cress, and watercress salads are a regular in my home. I love the spicy peppery-ness. Delicious!!!! I have watercress growing in a jar on my kitchen table – far better than flowers! almost. Couldn’t be more timely. Watercress is an “exotic” commodity here, and just yesterday I got my hands on a pack. I know exactly what to do with it now. cette photo entre Lulu et son oncle est superbe! Lisa, crab and watercress! Miam miam! I’m a salad lover, raised on salad daily, but I’m wondering why I don’t eat more watercress. You have inspired me. Watercress salad?? And I thought I was introducing my kids to a wide range of greens. i don’t think we have ever bought watercess. I am just discovering your blog and it s wonderful. Your dialog b/w you and your brother remind me of listening to my daughter and son. Next time I see watercress, we’re buying it. Thanks la tartine! Your pictures are always so amazing, colorful and appetizing. Wonderful blog and extraordinarly photographs. Merci! 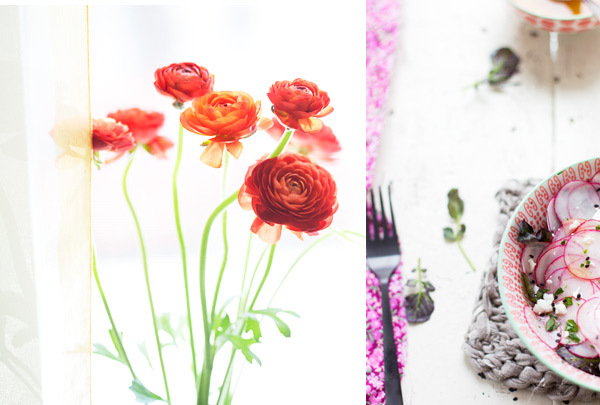 Question: Did you make the gray pot holder in the photographs? If so, where did you get the loops or fabric?? I’d love to make one (or buy one). Let me tell you first that I just love your blog! 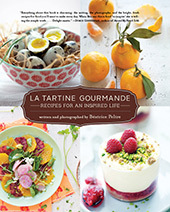 The photos are exquisite, very “fresh”, and the recipes are sophisticated, elegant, yet doable and simple. 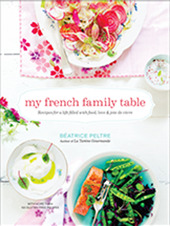 I also love the bilingual aspect: my husband is also French, I am Russian, we live in the US, and I cook all the time, so our household is a constant mixture of various languages and cuisines, so your bilingual franco-american cooking world is something that I can really relate to. Now about the salad. It was the very first dish from your blog I made, and it was also the first time ever I tried water cress. It is very simple, and the combination of flavors is really elegant and harmonious. Thanks! BTW, Benoit is hot. As hot as only Frenchmen come 🙂 My husband is also French, and he also exudes a flair of casual effortless sexiness. How do they do it? 🙂 The pictures are fantastic! Pingback: Food 101: Watercress | wedo.